Tucked away in the space formerly occupied by Pepperoncini Sotto, Il Granaio is the latest addition to the burgeoning Phoenixville dining scene. 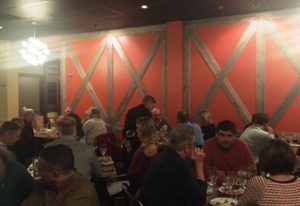 The restaurant, owned by chefs Josh Friedberg & Gent Mema, is the younger sibling of the Il Granaio in Glen Mills and Antica in Chadds Ford. Il Granaio literally means “granary” or “barn.” And the original eatery is well named as it is located in a venerable old building that once served as a granary for a local farm. The current incarnation, however, situated in the basement level of the Mainstay Hotel, lacking windows (save those of the faux variety), and replete with utilitarian tables & chairs, exudes about as much charm as an oversized 50s bomb shelter. Claustrophobics please take note. On the other hand, the superior quality of the cuisine more than compensates for the ambient shortcomings; and the bustling bar scene adds a decidedly lively note to the otherwise nondescript surroundings. Hopefully, since the restaurant only made its debut in November 2017, the owners will soon get around to ameliorating the atmospheric deficiencies. The menu and presentations are basically the same as the Glen Mills establishment with a few minor tweaks here and there. In any case, while you’re perusing, don’t be shy about digging into that basket of crusty Italian bread accompanied by a luscious island of hummus surrounded by a sea of herbed olive oil – a delicious harbinger of the good things to come. Starters include items like the ubiquitous Caesar salad – which was good but not outstanding… ditto the antipasto – fried calamari, grilled marinated octopus, roasted golden beets & creamy barrata cheese (a fresh Italian cheese made with mozzarella and cream), and whipped mascarpone & herbed ricotta served with crostini. The table favorite, however, was the simple but extremely satisfying Fritto Misto di Vedure. 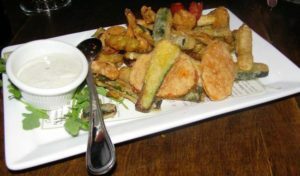 Freshly cut zucchini, yellow squash, bell peppers, carrots, Brussels sprouts, and onions are deep fried and served with a caramelized shallot and sage aioli. Everything was right on the mark… from the crisp light breading to the delightfully crunchy vegetables (as opposed to soggy) to the tantalizingly zippy aioli. The Mussels e Finnocchio proved to be another highly enjoyable starter. I’ve never been a particularly enthusiastic bivalve fan, but this presentation is quite excellent. The plump Prince Edward Island mussels are at the peak of good health and are sautéed with slivers of fennel and pancetta in a garlic white wine sauce. The broth accompanying mussels can, upon occasion, taste off-puttingly “funky.” But this is certainly not the case here. The broth is marvelously fresh and delightfully tasty enough to stand on its own merits. As you move on to the entrées, the thing that most impresses – especially among the house specialties – is the intensity of flavors. 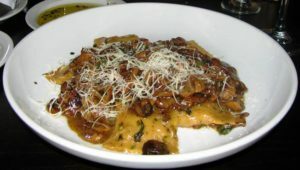 Take the Agnolotti Porcini (pictured), for example. Agnolotti are basically small crescent shaped ravioli that are stuffed with veal and mascarpone cheese. Here, however, it is the marvelously flavorful sage, brown butter & mushroom sauce that propels the dish into orbit. Simply irresistible. And the very same may be said for the Braised Veal Ragout. Tender morsels of veal are slow cooked with a variety of root vegetables and then tossed with pappardelle pasta. A ragout is really a stew; and it is the slow cooking that allows the various ingredients to meld together, intensifying the flavor. And the large, broad, flat pappardelle noodles are the perfect vehicles for capturing and holding those extraordinary essences. The Rigatoni alla Norma combines homemade pasta and sumptuously seasoned morsels of sautéed eggplant in an exceptionally enticing garlic & onion Pomodoro sauce… with a creamy dollop of herbed ricotta cheese providing the perfect finishing touch. Simple yet sublime. 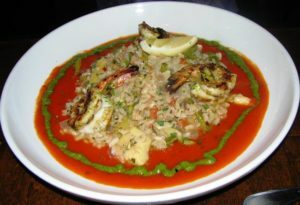 But even better, in my opinion, is the benchmark Risotto Primavera (pictured). The risotto itself is as smooth as silk, with artichoke and asparagus contributing their own unique flavor infusions, and a tiara of pristinely fresh baby shrimp adding immeasurably to the festivities. The real kicker, though – a feast for the eye as well as the palate – is the pool of roasted garlic Pomodoro, which, in turn, is bisected by a savory circular ribbon of arugula pesto. An absolute must for true risotto fans. Even the most pedestrian of presentations – the humble Chicken Parmigiana, for example – inevitably hits all the right notes. The exterior of the lightly breaded chicken breast is golden brown and slightly crunchy; the texture of the interior, on the other hand, is perfectly moist and succulent. Topped with a mozzarella melt and awash with marinara, the chicken breast reclines on a bountiful mound al dente linguine. As you have undoubtedly noticed, portion sizes here are quite generous, so chances are – unless you have the appetite of a ravening hyena – that you’ll be departing the restaurant with a doggie bag in tow. Generous the portions may be… But also keep in mind that several of the side dishes are well worth the modest extra expenditure (and calories)… The crispy Grilled Polenta is a fabulous supplement to any meal… ditto the Potato Siciliana, potato, onion, tomato and garlic roasted in olive oil and fresh oregano. 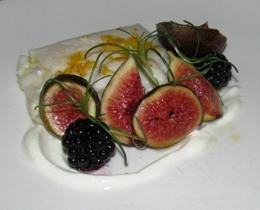 The table favorite, however, proved to be the fabulously enticing Golden Beets “Agro-Dolce” (pictured). In Italian cuisine, agrodolce is a traditional sweet and sour sauce made by reducing the appropriate elements, generally sugar and vinegar. Additional flavorings may also be added, such as wine, fruit, or even chocolate. 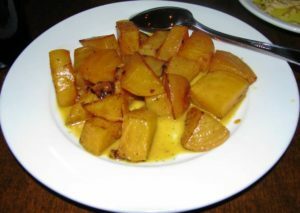 At Il Granaio, roasted golden beets are sautéed with orange peel, garlic, white balsamic vinegar and honey. At this point, desserts may seem somewhat superfluous… Once again, however, they are worth saving room for. You have the usual items, such as Crème Brûlée, Chocolate Chip Cannoli, and Mascarpone Tiramisu, – all quite good… But I’d go for either the decadently creamy Dark Chocolate Mousse Cake or the light and luscious Lemon Cream Cake. 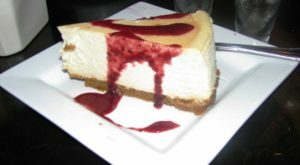 On the other hand, who can possibly resist the considerable charms of the scrumptious Lemon Cheesecake garnished with a splash of tangy raspberry sauce? With its unique take on classic Italian comfort cuisine, there is absolutely no question that Il Granaio makes an extremely positive contribution to the local dining scene.